By Matt Free Posted 14/08/2014 under General. 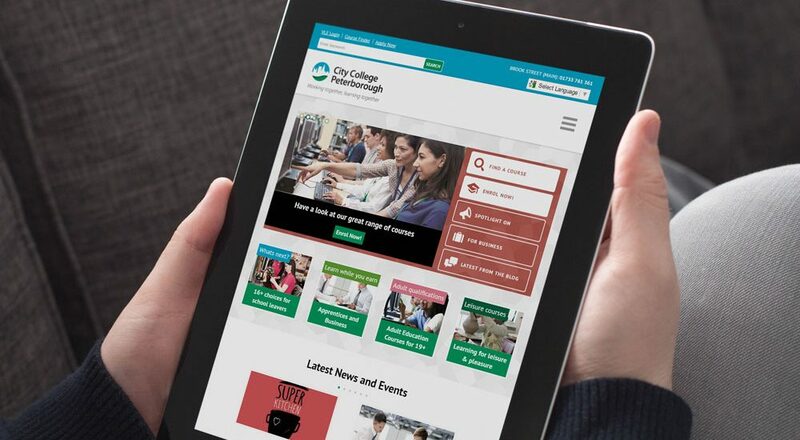 City College Peterborough (CCP) is looking forward to attracting even more students for decades to come thanks to its new website, designed and developed by the digital agency Free Thinking Design. The new site is fully-responsive across all devices from computers and laptops to tablets and mobile phones, meaning people can research their learning options on the move or at home. “The launch of this new website gives us another big reason to celebrate during our milestone year. The website has already received praise from the college community and is set to be a fantastic tool for communicating our expertise and attracting new students. Training courses listed on www.citycollegepeterborough.ac.uk are now also more visible in search engine results, thanks to work done by Free Thinking and PR and marketing agency Media Matters. This makes CCP courses easier to find online and automatically raises the online profile of the city centre college with would-be learners. Students can also stay on top of news, events and discussions at the college thanks to fully integrated Facebook, Twitter and Google+ profiles. Additional new features of the site include student and staff blogs where individuals can share insights from college life with the public. Click www.citycollegepeterborough.ac.uk to visit the site which is now live. Free Thinking Design are a small team of passionate digital creatives and web developers based in Orton Southgate, Peterborough. Free Thinking Design strives to offer a personal and responsive service for all clients.